my maternal grandmother was a seamstress, therefore everyone in my family sews. my mom, her younger sister, and their baby brother are all proficient at the craft. my uncle even apprenticed under a professional tailor before giving it all up to enter the exciting world of architecture. the need to create is something of a family tradition one might say. growing up, mom and i would occasionally hop a on train early on a Saturday morning, and head either to the world famous Garment District section of Manhattan, or to a tiny strip of Downtown Brooklyn, along the roadway that continues on to become the Manhattan Bridge. we were on the hunt for fabric in the wild. okay, so it was more like 'fabric in the mild', but the point is that we took our sewing seriously enough to make a day out of perusing the shops. the best part of the thing was the meticulous search through the bargain bins... in fabric stores... in the heart of the NY fashion scene! you can keep your endangered species and other 'big-game'. this is my kind of hunt! i recall winning a prize for a pincushion i hand-sewed at age six from the scraps of a dress my grandmother had made. she even taught me how to add a few colorful stitches to decorate the thing. it must have been that line of little red X's that won me first place. i tackled more and more challenging projects over the years to the point that mom would marvel at the hours i spent pinching and reshaping every dart or pleat till the garment fit like a second skin. we were mainly garment sewers (skirts, dresses, and such thing), but mom has probably produced several hundred yards worth of drapes and curtains to date. my interest in sewing has waned significantly over the years. 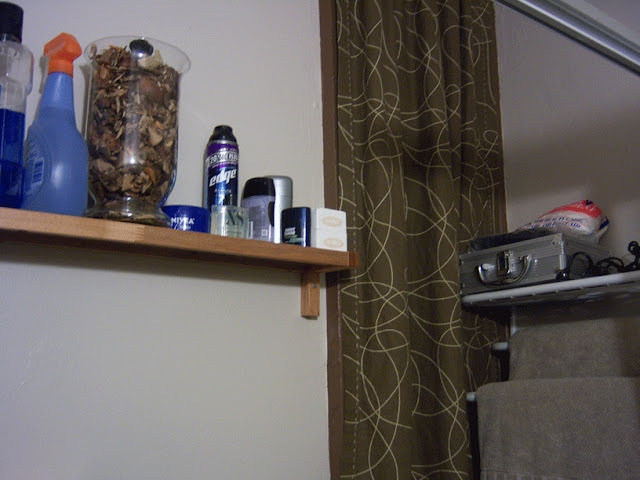 there was that one time (a decade or so ago) when i grabbed a needle and proceeded to hand-stitch a curtain for the oddly-placed little window in our old bathroom (that b-word again!). i used a long running-stitch to emphasize the hand-sewn aspect of the thing. aside from the odd hem or a quick dart to stop my jeans from falling down (i will save the rant about my lifelong struggle with jeans that always end up being far too loose in the waist for some other day), i seldom pull my sewing machine out of storage these days. it sat in a box, nestled among other boxes in the middle of the studio since we moved almost two years ago, until i finally plucked up the courage to bring it back into the light. i wanted to sew something... anything. he wanted me to make him a shirt with skull fabric (or, better yet, teach him to make such a thing), but i need to clear out the cobwebs before tackling such an intimidating task. what do you make when you have not sewn in years and you are afraid you may have forgotten how to do so? i pondered that question while working on that grey sweater for him, and, as i crammed the bulky mass into a too-small project bag, it dawned on me that i too could make such things. so, i made a bag! 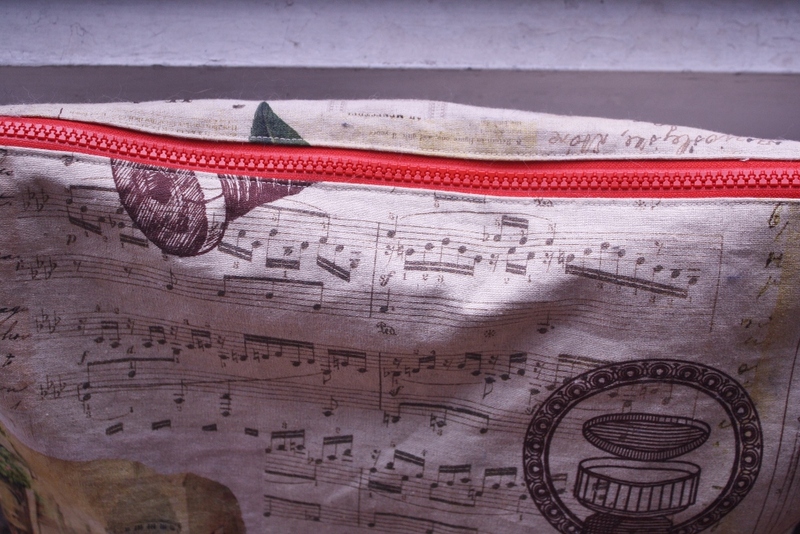 each side of the bag features a different section of the overall print on the fabric. 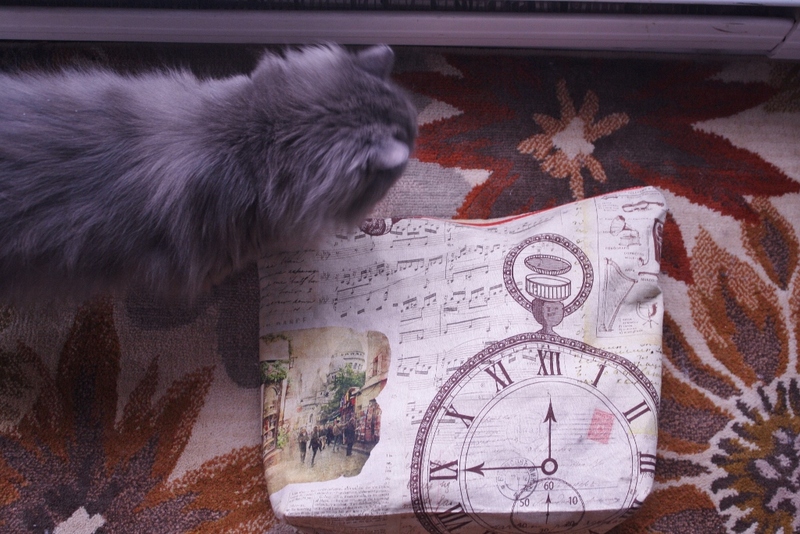 and it has been kitty approved. 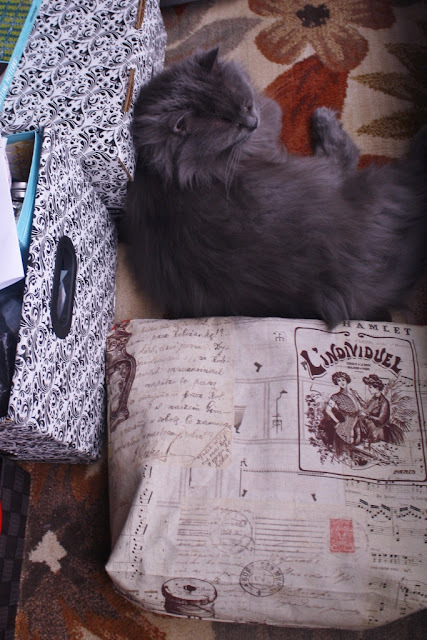 soon as i snipped the last thread, Baby Bear was already trying to nap with the thing. 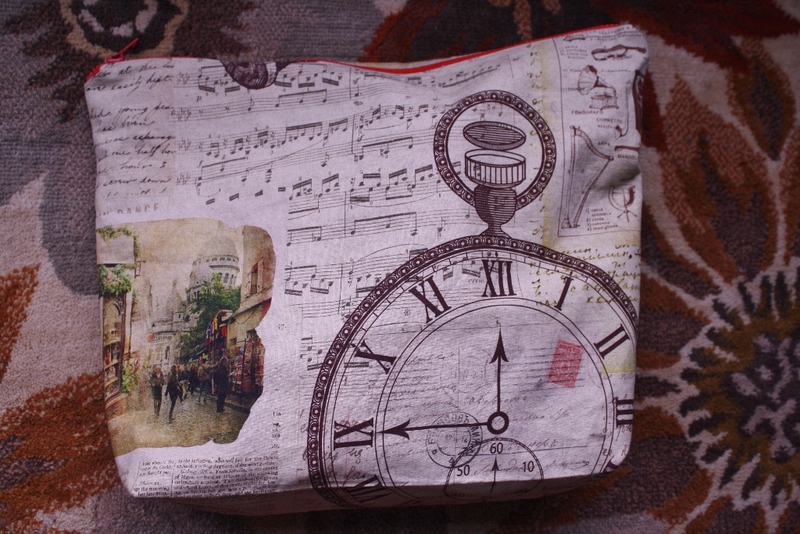 this is some sepia-toned fabric i purchased in recent years. 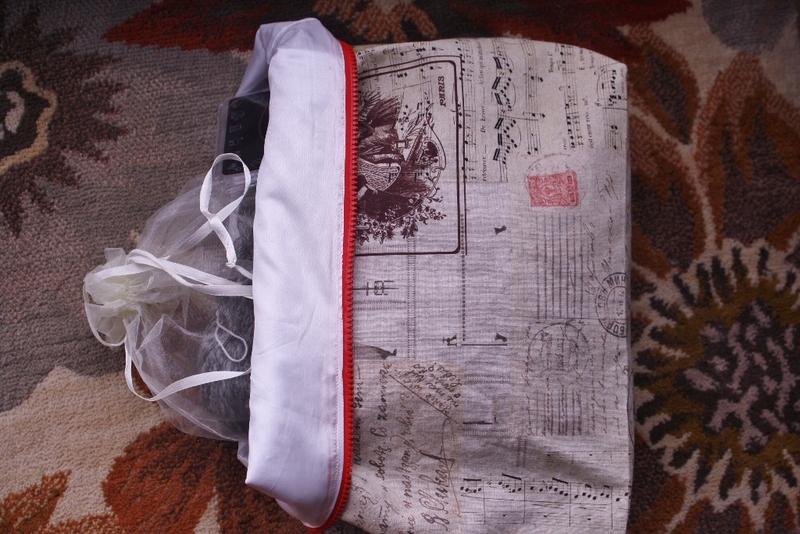 i added a light iron-on backing to add some body and structure, as the material was rather light for the bag. 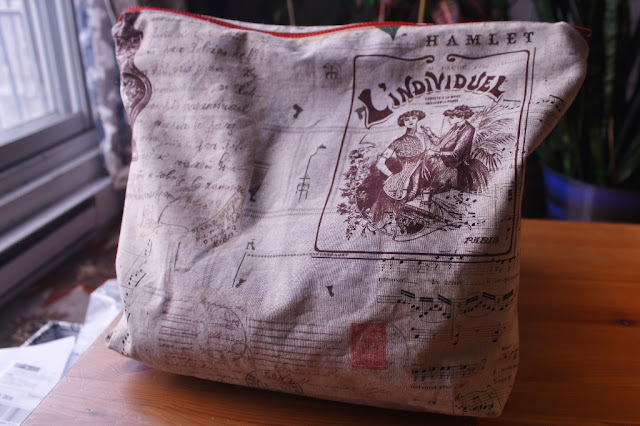 i opted for a satiny lining fabric (also from stash) to reduce the friction on my precious yarn as it tumbles around inside the bag. i will use a sturdier satiny lining in the future, as getting the thread tension right on this stuff proved to be the biggest challenge. i am definitely rusty. the most important thing was the need for pockets. i z-folded the lining and stitched along the fold lines to create one large pocket across the width of the piece, then divided that into two pockets. i may have had a strong drink before committing to making the pockets uneven. the larger one fits a pattern book, and the smaller one is perfect for extra packs of knitting needles and my Altoids tin of safety pins, darning needles, and stitch markers. 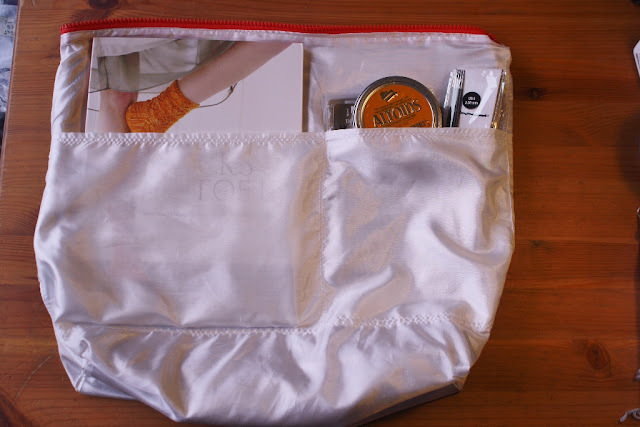 it is the Swiss Army Knife of project bags. i opted for a bright red zipper to match the few pops of red in the rather sedate fabric. 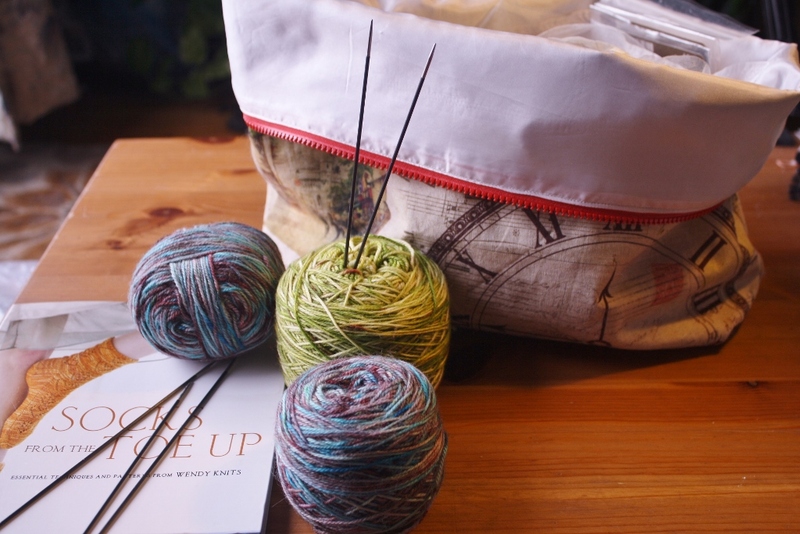 it is a generous-sized bag that can fit a bulky adult sweater or multiple smaller projects, and the top can be folded over for use as an open basket to hold all sorts of yarn things. it currently contains a large project i am working on at mom's request, and some of my hand-dyed yarn that may be destined to become socks for him... maybe.